I recently started working on a new project – an application that would tell you when a user or computer last logged on to your Active Directory domain so that you could identify old unused accounts. 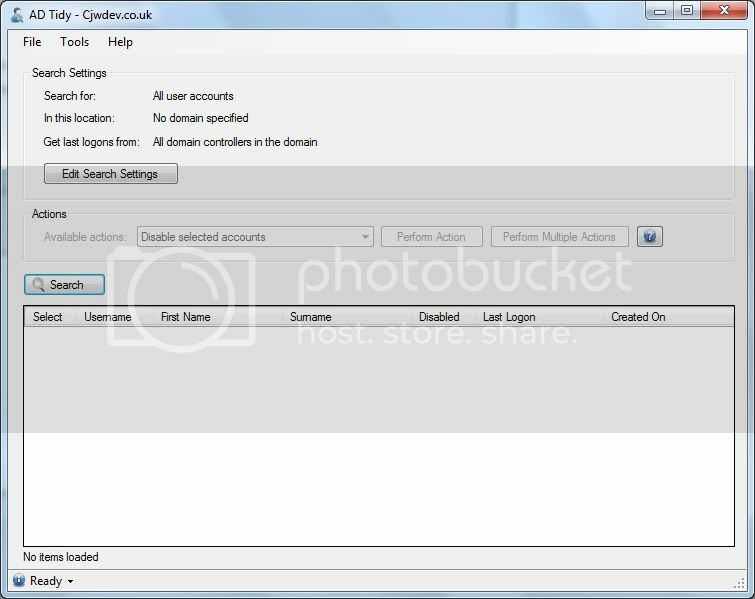 I got the application up and running fairly quickly and it did get the last logon for all users/computers in our domain, but once we had identified the unused user accounts we then needed to disable, delete or move accounts that had not logged on for over X number of days. After some searching I found that there don’t seem to be any free applications that can do this (there are plenty of free scripts but all of the nice user friendly GUI apps you have to pay for) … so I decided to extend my application to provide this functionality (and more) and make it completely free for anyone to download and use, as many times as they want and on as many users/domains as they want. If you have any other features that you would like to see added in there then feel free to let me know, either by leaving a comment here or by sending me an email at cwright@cjwdev.co.uk and I will see if I can fit your suggestion in to the first release. If I don’t manage to get your feature request in to the first version then it will be in the next version, which will not take months to be released – I plan on bringing out new versions often, or as soon as there is a decent new feature available. I’ve been looking for a tool like this for such a long time! My company manages networks for many different organizations, and housekeeping is always a real pain with user and computer turnover. Especially since many of our customers have SBS servers, and have a fairly low max license count. I am downloading the beta, and will post some feedback. Thanks 🙂 would love to hear what you think of the BETA. The final version of the app is nearly finished now, should be another week and then it will be ready for public download. There is one bug in the BETA that I should warn you about (which has been fixed for the final version), though it probably wont affect you if you are dealing with SBS servers – the search will not bring back more than 1000 results from each DC it queries. Oh and I work at an IT support company like you as well so I’ve put a lot of effort into making this app work for domains that your user/computer accounts is not a member of. All of the other similar apps that I have tried (that you have to pay for) seem to only work with your local domain, but mine will work even if you just VPN in to a network from a home PC – basically as long as you are able to resolve the domain name and DC names then it should work. I doubt that bug will ever really be an issue for me. Our largest customer is a couple hundred nodes, so not too worried about the 1000 result limit. Works great so far! I’ve never had so much ease in cleaning up a DC before. One question I have, I haven’t yet tried this on a DC running exchange, (ie: pretty much any SBS server). My question is, when deleting an SBS user from the AD, the system prompts you if you would also like to delete their exchange mailbox. I was afraid to experiment with this on a production server, have you tested this instance? I don’t mind if it doesn’t, but just so I know to take note of the stale users before deleting them from the ADTidy window, so I can manually delete the same object from the exchange server. Once again, kudos on an amazing app, you’ve made my working life so much easier! Work smarter, not harder, that’s my philosophy. If you ever find yourself in Ottawa Canada, let me buy you a beer! Not a problem, I appreciate all the work you’ve put into this app. I’ve only been using it as a lookup tool for the moment, to query for old objects, and making any other changes manually. I was definitely going to be waiting for the complete version before I tried any of the integrated features on productions sytems. I love beta apps, but you can’t be too careful. As soon as the final version is available, I will be the first to download. I’ve been out of the loop for a bit, and I haven’t gotten around to an update on here for a while, I just wanted to drop by and say that this is the most amazing server maintenance app that I’ve ever come accross. I haven’t run into any issues with version 1.0 so far. Thanks again for taking the time to set this up for your fellow administrators, and especially for making this available at no cost. An awesome piece of software, thanks very much! Really helped me with a small project that I have been doing. Definately payware quality. Keep up the good work. Great app, keeps everything together and easy to see! Thanks Mike 🙂 and thanks a lot for the donation, it is very much appreciated! the tool is very nice and in deed helped a lot in keeping AD clean. As a request if possible can you add another function that can help to change Workstation’s Local Admin password. I have tried to look out for a tool that can easy the process of changing desktop /Laptop local Admin password but couldn’t find any. This is an awesome tool! I was using PowerShell before I found the tool that you made. However, this is so much better! It makes account audits a whole lot easier. I am also testing out your AD Info tool – which is awesome as well! I wanted to add a thanks for this as well. It’s a nice looking tool and is easy to use. I will probably use it to find accounts that have not been logged on in the future but for now I just used it to find the last log on time of a specific user. Thank you for this awesome tool! Our OUs were full of old junk, you saved me a lot of time. This tool is amazing! I was sure I was staring into the gaping maw of days worth of manual deletions and disabling. Thanks!